This month we are starting a new monthly blog post series designed to help you work more productively. It will include tips, tricks, and tools that we’ve found increases productivity in the workplace. This month our focus is on the all-important task list that helps us all get through our day. We’ll give you some insights on the task management tools we use as we work to make online file sharing more secure, easier, and more controllable for businesses. Recently we asked some of our co-workers at Onehub what they like to use to keep up with their day-to-day tasks. As you can imagine, different types of task lists fit different people and their jobs. There is no one-size-fits-all. 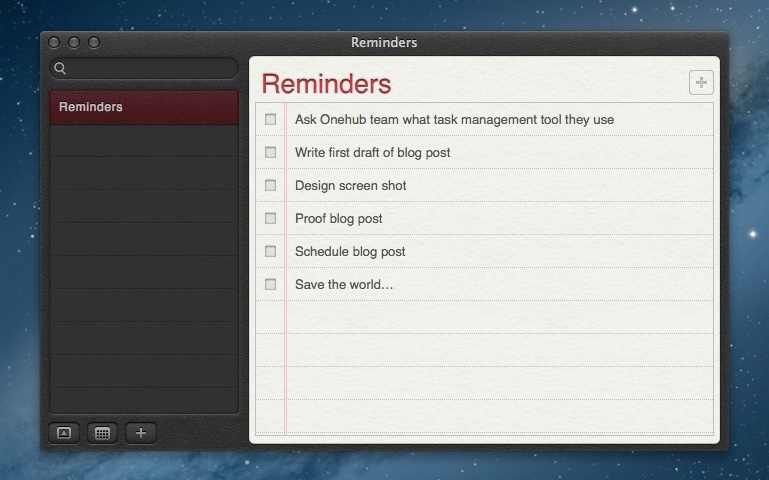 Our CEO – Charles likes to use Wunderlist to keep track of his daily tasks. Charles says he really likes the program because it’s fast, simple, and free. He is able to schedule tasks and access them quickly and easily. Charles also uses Google calendar to track all of his meetings and daily call schedule (which is pretty full these days). Customer service team – uses an app called Alarms. They use it to keep track of their time sensitive tasks. When using this program, an alarm pops up on your screen at the time you’ve set. It showcases the tasks that you previously listed so they are right in front of your face. At that point, you can manage your tasks by marking them complete, rescheduling the task for later or when you have time, or even deleting it. Development team – uses the development tracking tool Lighthouse to create new projects, track workflow, and collaborate when building new features. They also use the Reminders app by Apple for reminders such as scheduling meetings. They like Reminders because it synchronizes across multiple devices. Design team – Wunderlist to track their task list. Some team members also use Mailbox to track e-mails that need to be addressed on a specific day. Marketing team – uses Google calendar for tasks, reminders, and scheduling of meetings and calls. Copy team – likes to use the free version of Producteev to manage tasks (although after writing this list, our writers thinks they might try out Wunderlist!) . As you might expect, we all use Onehub to collaborate and share files for project management and all of our marketing projects. As you have probably noticed by now, there is no single task manager that is right for everyone. One of the wonderful things about working at Onehub is the flexibility to pick the right task management tool that makes you productive. Some people may like using a calendar, while others use custom-designed project tools to manage milestones and tasks. At the end of the day, Onehub provides its team with the flexibility to do whatever it takes to get things done. This entry was posted in Uncategorized by Onehub. Bookmark the permalink.